Here in the area in and near Port Townsend we are well and truly blessed with one of the best maritime climates you can find. The Olympic Peninsula's spectacularly rugged interior terrain provides us with another extraordinary benefit — the rain shadow that brings a lot more sun than the Pacific Northwest's rainy reputation would lead you to believe. Port Townsend averages around eighteen inches of rain a year, while some western parts of the Olympic Peninsula are soaked with more than two hundred inches of the wet stuff. A picture can speak louder than words, so here's a precipitation map for your enjoyment. If you click here or anywhere on the map, a browser window will open with a larger version that you can save to your computer and print while you are thinking about why you should be living here, too! 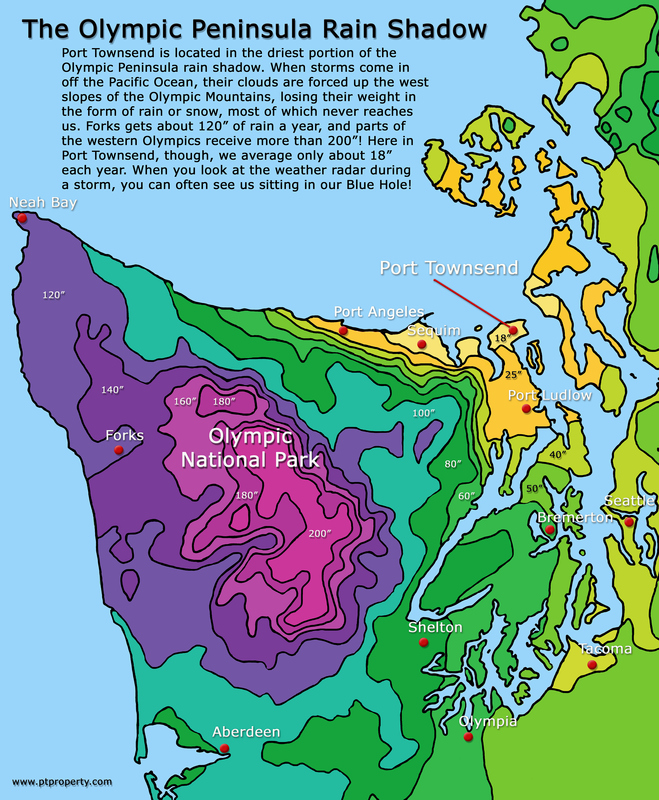 Click here to go to my blog to learn more about the rain shadow and our local climate.